High School Football America LLC (“HSFA”) is a multi-platform media company creating original content — text, video and audio. Founder Jeff Fisher, who has won numerous awards for journalism and public relations, has captured thousands of high school sports stories that serve as a lightning rod for promoting positive stories about student-athletes. In essence, these stories highlight how high school sports serve as a bond for community togetherness. HSFA’s mission is to promote student-athletes, coaches, schools and communities. High School Football America grew out of The Big Ticket that Fisher created, produced and hosted originally in 1993 on WFMTZ-TV in Allentown, Pennsylvania. The Big Ticket was America’s first-ever, hour-long Friday night high school football show that will enter its 22nd year on the air during the 2015 season. Under Fisher’s leadership, The Big Ticket was named by the Associated Press as The Best Sports Television Show in Pennsylvania in 2000. HSFA currently produces two internet high school sports radio shows — High School Football America and NHSCA Sports Hour — that average a combined 150,000 downloads per show. 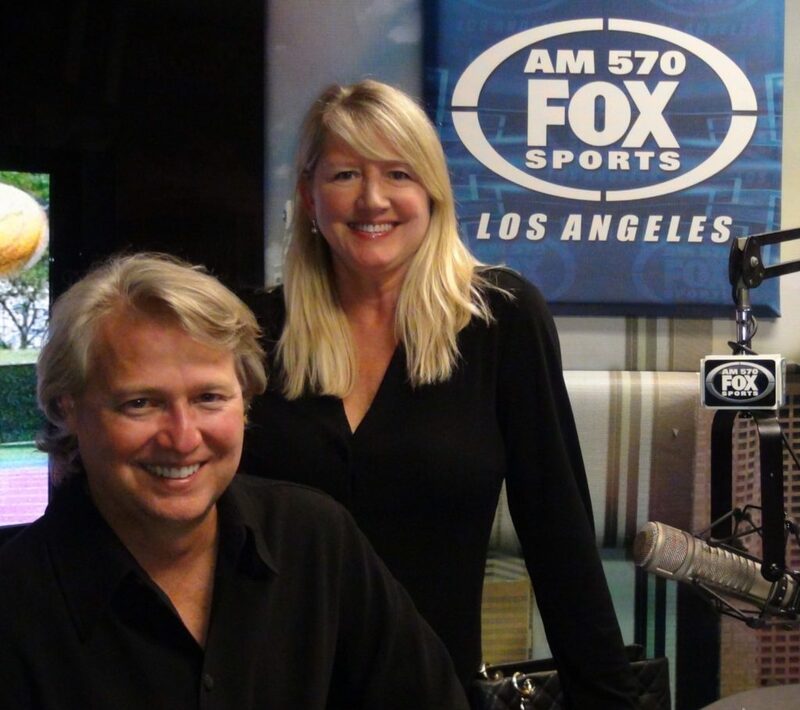 In 2012, Fisher and Hoffman produced the highly-acclaimed High School Football America/SoCal radio show on KLAC AM 570 Fox Sports LA. High School Football America is 20+ years in the making that is fueled by Jeff Fisher and Trish Hoffman’s passion for telling America’s story through high school sports. It all began in 1993 when Jeff helped create and co-hosted the award-winning high school football highlights show called The Big Ticket in Allentown, Pennsylvania where he worked as WFMZ-TV’s sports director anchoring five-shows a day; performing play-by-play in several sports; was the voice of the Lehigh University men’s basketball team, plus the host of the Lehigh Sports Forum. Jeff & Trish actually met on the 10:00 news. Literally! Trish was the 10:00 PM Anchor and 5:00, 5:30 and 6:00 P.M. Live Reporter for all three shows. They left the station in Allentown to move to Chicago where Trish was named the first-ever anchor at Morningstar.com. Jeff anchored and reported at Fox Sports Net doing nightly shows in the Bay Area, Chicago and Ohio. It was in Chicago where Trish and Jeff re-ignited the idea to do a high school sports multi-media project that would place a premium on great storytelling. In 2003, they met with a web developer to help develop the daunting task of this one-of-a-kind website. As with any entrepreneurial endeavor, Jeff needed to pay the bills while chasing the dream. Luckily, a friend needed a public relations firm to work with his multi-billion dollar company. In 2003, Blitz Group was born as a boutique media firm that specialized in placing experts in the media. Blitz has won numerous awards for placing clients in/on most major national and international media outlets. Since 2005, Blitz has garnered approximately $75 million in editorial media placements for its clients. Jeff loved it and bolted for the computer to see if the domain name/URL was available and it was! So with that, High School Football America was born! Naming the website High School Football America gave such a lift of excitement. However, bliss doesn’t last forever! They quickly realized the need for more funding to fuel the newly-named passion, plus some assumptions on who would visit our website. In the first season they had more than a million page views on our 52 blog blogs. Those page views very quickly gave the assumptions to begin writing a business plan…that by the way, is a real pain…but truly gave a road map for the future. Jeff began defining the project further with a goal of becoming a multi-media company with a bigger goal of being a national high school football radio show that would serve as a marketing tool to drive people to our website. With the goal of launching a national radio show, Jeff developed two internet radio shows: one for the National High School Coaches Association and the other called High School Football America. You can listen to both shows, on the ArtistFirst Worldwide Radio Network, plus this website. Both are highly successful; averaging a combined 150,000 downloads for each episode. With great numbers, Jeff decided to go to the top of the media food-chain to look for a national media partner. That partner was Fox Sports Radio, led by Don Martin in Los Angeles. Don, who is a huge high school sports fan having done some very creative high school sports coverage in Denver, said he liked the concept of a national high school football radio show, but wasn’t sure how to pull it off, since the book on such a huge undertaking hadn’t been written. For the next two years, High School Football America kept chugging along with its blogs and traveling the country to make videos that told the story of how high school football is an integral part of the American fabric. It was to make sure that High School Football America kept proving itself to Don, who kept in constant contact, while scoring big deals like his LA affiliate KLAC-AM becoming the flagship station for the Los Angeles Dodgers. Paydirt came on February 13, 2012 when Don said let’s start the journey with a radio show on KLAC AM 570 Fox Sports LA called High School Football America So-Cal. With a mere six-months to raise capital, sign sponsors and get a show on the air, Jeff worked 18-hour days to achieve his dream. HSFA hit the Los Angeles airwaves on August 11, 2012. During our five years in Los Angeles, High School Football America has evolved into one of the country’s most respected sources for high school football news and information with the addition of a state-by-state news section and our daily podcast called the High School Football America 2 Minute Drill. In January 2015, Jeff added the Coaches Job Board to his site. As far as what the future holds? Jeff will continue to follow his mission statement, which is to tell the stories of America’s student-athletes, coaches, schools and communities.